Employees at Friesens Corporation in Altona are known for giving back to the community, and the Altona Community Foundation is the latest group to receive support. The company recently launched an Employee-Directed Giving Program where each employee-owner votes for organizations they feel would benefit the most from charitable giving. 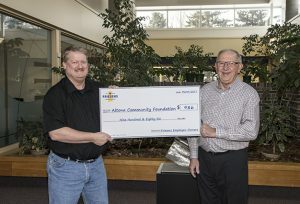 The Altona Community Foundation was selected as one of the recipients, and recently received a $986 donation. Since its inception in 1994 the Altona Community Foundation endowment fund has grown to $1.237 million, and its board has distributed over $729,000 in grants to a variety of local community projects.